Woonona beach showing the dune plantings. Photo courtesy of Sand on Beaches Facebook Page. WOLLONGONG City Council staff have begun work on removing vegetation on several beaches, including Bulli and Woonona. The work is the first stage of the Wollongong Dune Management Strategy. Council endorsed the works, outlined in the Implementation Plan, in August. Manager Environment Strategy and Planning Renee Campbell said the work was an important step towards improving sightlines for lifeguards and lifesavers. “During our consultation we found that it was important to improve the sightlines for lifeguards and to also increase the beach amenity for beachgoers at these beaches,” Ms Campbell said. The first stage of this work will involve the removal of a number of large weed trees, dead vegetation and some Coastal Wattle at the back of the dunes and along the beach access paths. Under pruning of some native vegetation will also be undertaken to create better access into each site for further weed management work by bush restoration contractors and Dunecare volunteers. Works will be completed at Bulli, Woonona, Towradgi, Fairy Meadow and Wollongong City beaches before the end of this month. Tree management work will be undertaken along either side of the access paths and at the back of the dunes. After the tree management works, bush regeneration contractors will then begin further weed and vegetation management work at these beaches, as well as Bellambi and Corrimal beaches. At Coalcliff beach, the current height of vegetation is causing line of sight issues for the lifesavers. Some vegetation will be pruned and weed trees removed to enable a clear line of sight from the patrol room to the swimming area. These vegetation management works are the start of the actions outlined in the Dune Management Strategy. This work will also be used as part of Council’s future work to manage native vegetation and weeds in the dunes, improve sightlines and accessibility, reduce potential fire risks and enable better access for bush restoration contractors and volunteers. For more information you can visit Council’s website. Woopee. if you saw the number of trees removed at Fairy Meadow and Towradgi Beaches, you would say, SO WHAT! Hardly anything was removed and certainly nothing that blocked line of sight for lifesavers. Most of the vegetation that was removed was behind lifeguard viewing points and will obviously be the locations for more plantings. The main problem is at the front of the beach along the shoreline where 2-6 metre sandcliffs form thanks to sand buildup along the shoreline under the vegetation. These sandcliffs also block sightlines and are dangerous as they block beach pedestrian access to and from the beach and can collapse. I have heard of two occasions, one at Towradgi Beach and one at Woonona Beach, where tourists and a local, have been trapped on the beach unable to escape waves banging into them, because of the unmaintained vegetation. The Woonona local was considering what to do if he was washed into the water , the situation was that serious. 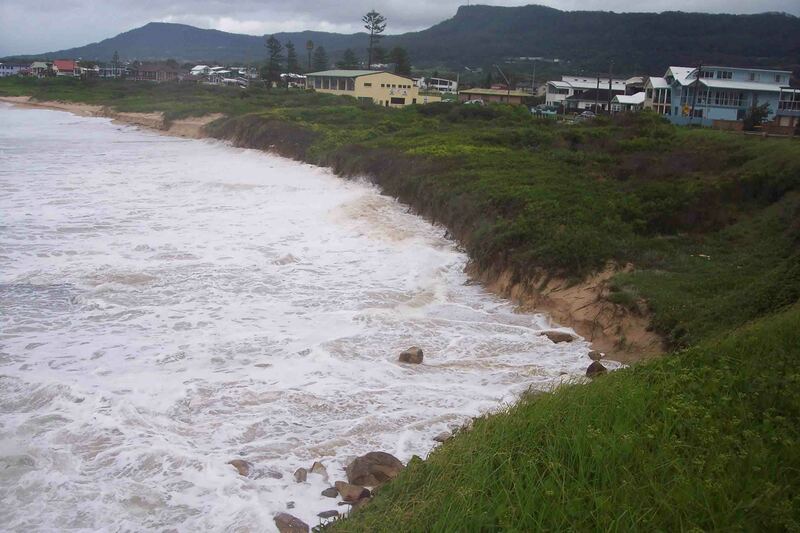 This problem has developed due to the vegetation spreading to the water on 10 Illawarra beaches. According to a correspondence from Council’s Renee Campbell, “the vegetation has spread outside of its original planting areas and requires ongoing maintenance”. The areas where these 2 separate potentially life threatening events took place, were outside of the Councils Vegetation Strategy area. The strategy only takes in the patrolled areas. Despite the risk to the public, especially children, well known to Council after submissions from the public were surrendered for the strategy, and the problem being identified as Council’s responsibility by Renee Campbell, the safety issues of unmaintained vegetation will remain on nearly 90% of our populated beaches. The “Coastal Dune Management Manual” Council claims to follow, clearly shows the plant species that should be found on our coastal dunes and if it was followed the dangerous sandcliffing and beach access and amenity problems would not exist. Council however, has decided to ignore the manual on many points and is happy to let the dangerous safety risks to stay by allowing the plants to stay in the wrong places. Despite experiencing the problems this species has already caused on our beaches in real life already, Council is continuing to plant more of the species on Towradgi beach. The Coastal Dune Management Manual even has warnings of using this species, but this is also being ignored, by Council. The beaches presently have plenty of accreted sand on them but, when storms hit our coastline things change when the sand gets washed away there is no room to walk between the sea and the sandcliffs and this could prove fatal for the unsuspecting! Good on ya Michellzie, now you and all your mates can put ‘ocean views’ on your real estate adds and make some extra pocket money. Sorry Mattloft, the vegetation has no impact to my views as I live on a hill! How about you post something intelligent that supports how you feel? The sandcliffs are now increasing in number and size on all of the vegetated beaches as sand blows into them with every onshore wind. What you see in the photo is happening along the entire length of beaches. Natural Dunes form because sand blows into vegetation beyond the beach and a dune forms. It grows in height and then slopes gently to the sea. Presently, we have this. Because the introduced vegetation was planted on the beaches, so close to the water, the dunes cant fully form, by the time they get to the water, what we get is half formed dunes which are affected by wabes. Instead of water running up on a gently sloping beach, we get waves banging into sandcliffs. Who ever heard of a half formed sand dune. Well that’s what planting the wrong type of vegetation on the beach will give you and thats what’s been done. Now Ill be the first to admit that Im no rocket scientist but you don’t have to be a genius to work out this is not nature especially when the vegetation that forms these half dunes, was mass planted by man. We only want what nature wants, complete dune systems, not half dune systems! Nature doesn’t do anything by halves, only man does that. Do you really want half formed dunes on our coastline? This is the unfortunate result of lobbyists with sensationalist and anecdotal arguments who have sadly swayed the council and many Illawarra residents. Coastal erosional processes are complex and cannot be explained by the over-simplified catch cries of these lobbyists. Also being ignored are the effects of climate change such as sea level rise and increasing storm frequency and intensity, which are expected to increase coastal erosion, and may have more severe impacts if dunes are not naturally stabilised by vegetation. I personally suspect these lobbyists are motivated by property value associated with clear-lines of ocean view, unobstructed by the natural vegetation which is now beginning to regenerate after european clearing. Certainly their cherry-picked mishmash of anecdotal arguments demonstrates that they are not genuinely concerned for either community or evironment. Sad day. FACT Accurate and representative temperature measurements from satellites and balloons show that the planet has cooled significantly in the last two or three years, losing in only 18 months 15% of the claimed warming which took over 100 years to appear — that warming was only one degree fahrenheit (half of one degree Celsius) anyway, and part of this is a systematic error from groundstation readings which are inflated due to the ‘urban heat island effect’ i.e. local heat retention due to urban sprawl, not global warming…and it is these, ‘false high’ ground readings which are then programmed into the disreputable climate models, which live up to the GIGO acronym — garbage in, garbage out. FACT In the UK, every mild winter saves 20,000 cold-related deaths, and scaled up over northern Europe mild winters save hundreds of thousands of lives each year, also parts of ice caps are melting yet other parts are thickening but this isn’t reported as much (home experiment: put some water in a jug or bowl, add a layer of ice cubes and mark the level — wait until the ice has melted and look again, the level will have fallen). Data from ice core samples shows that in the past, temperatures have risen by ten times the current rise, and fallen again, in the space of a human lifetime. 3	MYTH Carbon Dioxide levels in our atmosphere at the moment are unprecedented (high). FACT Atmospheric carbon dioxide levels, currently only 350 parts per million have been over 18 times higher in the past at a time when cars, factories and power stations did not exist — levels rise and fall without mankind’s help. 4	MYTH Mankind is pumping out carbon dioxide at a prodigious rate. FACT 96.5% of all carbon dioxide emissions are from natural sources, mankind is responsible for only 3.5%, with 0.6% coming from fuel to move vehicles, and about 1% from fuel to heat buildings. Yet vehicle fuel (petrol) is taxed at 300% while fuel to heat buildings is taxed at 5% even though buildings emit nearly twice as much carbon dioxide! 5	MYTH Carbon dioxide changes in the atmosphere cause temperature changes on the earth. FACT A report in the journal ‘Science’ in January of this year showed using information from ice cores with high time resolution that since the last ice age, every time when the temperature and carbon dioxide levels have shifted, the carbon dioxide change happened AFTER the temperature change, so that man-made global warming theory has put effect before cause — this shows that reducing carbon dioxide emissions is a futile King Canute exercise! What’s more, both water vapour and methane are far more powerful greenhouse gases than carbon dioxide but they are ignored. FACT The planet does not need saving, but taking this on anyway, removing every car from every road in every country overnight would NOT produce any change in the carbon dioxide level of the atmosphere, as can be seen using the numbers from Fact 4, and in any case it is pointless trying to alter climate by changing carbon dioxide levels as the cause and effect is the other way round — it is changes in the activity of the Sun that cause temperature changes on earth, with any temperature rise causing carbon dioxide to de-gas from the oceans. FACT Extreme weather correlates with the cycle of solar activity, not carbon dioxide emissions or political elections, the recent heavy rainfall in winter and spring is a perfect example of this — it occurred at solar maximum at a time when solar maxima are very intense — this pattern may well repeat every 11 years until about 2045. 8	MYTH The climate change levy, petrol duty, CO2 car tax and workplace parking charges are justifiable environmental taxes. FACT As carbon dioxide emissions from cars and factories does not have any measurable impact on climate, these taxes are ‘just another tax’ on enterprise and mobility, and have no real green credentials. 9	MYTH Scientists on the Inter-governmental Panel on Climate Change (IPCC) issue reports that say ‘global warming’ is real and that we must do something now. FACT Scientists draft reports for the IPCC, but the IPCC are bureaucrats appointed by governments, in fact many scientists who contribute to the reports disagree with the ‘spin’ that the IPCC and media put on their findings. The latest report suggests that the next 100 years might see a temperature change of 6 Celsius yet a Lead Author for the IPCC (Dr John Christy UAH/NASA) has pointed out that the scenarios with the fastest warming rates were added to the report at a late stage, at the request of a few governments — in other words the scientists were told what to do by politicians. 10	MYTH There are only a tiny handful of maverick scientists who dispute that man-made global warming theory is true. FACT There are nearly 18,000 signatures from scientists worldwide on a petition called The Oregon Petition which says that there is no evidence for man-made global warming theory nor for any impact from mankind’s activities on climate. Many scientists believe that the Kyoto agreement is a total waste of time and one of the biggest political scams ever perpetrated on the public … as H L Mencken said “the fundamental aim of practical politics is to keep the populace alarmed, and hence clamorous to be led to safety, by menacing it with an endless series of hobgoblins, all of them imaginary” … the desire to save the world usually fronts a desire to rule it. Oh my goodness I did not realise you were a climate change denialist. again thanks for clarifying. Good stuff Simon, deny everything, keep those eyes covered and hope for the best. The future looks like its taking care of itself when one faces the wrong direction. No, I’m just not as gullible as some. I don’t just take for granted what others say without without question. What is the current rate of sea level rise Caitlin, Matt? I put it to you that it currently sits at 0.6mm per year. The Bruun Rule states that a 1 centimeter rise in Sea Level equates to a 50 centimeter retreat of the beach. At just 0.6 of a MILLIMETER, current retreat sits at a poultry 30 MILLIMETERS per year. My kids make more of a splash than that when they play on the shoreline! Now, I don’t know about you, but plain old common sense tells me that if last year, during our storm season, that if the sea level crept up our beach by a piddly 3 centimeters, that on it’s own is NOT responsible for the creation of a 6 METER HIGH scarp, but I’d welcome your learned thought on the matter. You seem to have all the research at your finger tips. Unfortunately you have been swindled by the great Al Gore circus carnival, who’s only real agenda is international wealth redistribution. There has been no significant sea level rise since about 1960. Prior to this, IPCC MODELLING and actual real world FIELD OBSERVATION Data were somewhat in alignment. Since about 1960 all of a sudden, the IPCC data models show significantly increased rates of rise, BUT, actual real world observations show significantly lessor, to the point of being negligible, rises in sea levels. Have you ever asked yourselves why there is such a divergence between real world observations and IPCC “Models”? While the IPCC and its boy scouts present wilder and wilder sea level predictions for the near future, the real observational facts demonstrate that sea level has remained virtually stable for the last 40-50 years. But it would be remiss of me to just concentrate on the immediate time zone. Next I’ll post you some data going back a few million years. You might find it interesting, more likely though, given your unwillingness to listen to the ulterior argument, you’ll most likely dismiss it. And that is your prerogative. Sea level varied by over 100 meters during glacial-interglacial cycles as the major ice sheets waxed and waned as a result of changes in summer solar radiation in high northern hemisphere latitudes. Paleo data from corals indicate that sea level was 4 to 6 meters (or more) above present day sea levels during the last interglacial period, about 125,000 years ago. Climate and ice-sheet model simulations indicate that Greenland was about 3°C warmer than today and that the Northern Hemisphere ice sheets contributed 2.2 to 3.4 metres to the higher sea level, with the majority of the rise coming from the partial melting of the Greenland ice sheet. During the last ice age, sea level fell to more than 120 meters below present day sea level as water was stored in ice sheets in North America (Laurentian, Cordilleran), Greenland, northern Europe (Fennoscandia and the Barents region) and Antarctica. As the ice melted, starting around 20 000 years ago, sea level rose rapidly at average rates of about 10 mm per year (1 m per century), and with peak rates of the order of 40 mm per year (4 m per century), until about 6000 years ago when they started to level off. Sea level rose much more slowly over the past 7,000 years. The sea level 2,000 years ago can be deduced by (for example) examining fish tanks built by the ancient Romans. Because the tanks had to be at sea level for the sluice gates to function, we can precisely estimate sea level during the period of their use. Comparison of this level with historical records indicates that there has been little net change in sea level over the past 2000-6000 years. “Sea level is rising,” Giegengack agrees. But, he explains, it’s been rising ever since warming set in 18,000 years ago. The rate of rise has been pretty slow — only about 400 feet so far. And recently — meaning in the thousands of years — the rate has slowed even more. The Earth’s global ocean level is only going up at less than the thickness of one nickel. For the catastrophe of flooded cities and millions of refugees that Gore envisions, sea levels would have to rise about 20 feet. (DECCW, 2009a) that sets SLR planning benchmarks of 40cm by 2050 and 90cm by 2100 These benchmarks are derived from both IPCC projections and CSIRO research. That 90cm rise equates to an annual average rise of 10.3 Millimetres. Let’s just forget my 0.6mm claim of the last post and use two of Australia’s longest tide gauge records: Fort Denison, Sydney, and Fremantle, in Western Australia. WHY DOES IPCC MODELLING SHOW SLR AT OVER 10mm ANNUALLY, YET ACTUAL FIELD OBSERVATION SHOW A RISE OF JUST 1.3mm PER YEAR? At real world observed rates, the preposterous 900 Millimetre IPCC predicted rise by 2100, will actually just be a tiny 113.1 MILLIMETRES – (that’s over an 87 Year period). In the shorter term, by 2050 (a 37 year period), the rise might be a mere 48 millimetres. The dire warnings are a hoax, and you have swallowed it all, hook, line and sinker! But of course these are just my substantiated views, you are welcome to yours. As opposed to when a storm hits and washes all sand and man-made back dune infrastructure away? Leaving council to deal with expensive clean up costs, on-going remedial works to replace damaged bike paths and homes. Surely this is more dangerous than someone being ‘trapped on a beach’? If it is that dangerous on the beach, surely the individual must be held responsible for their own actions if they are well aware of a significant swell at the time in question..
Don’t try and make out your trying to save lives when it’s plainly obvious you a driven by economic rewards through increased real estate sales if they have ‘ocean views’. Life guards should be on the beach not behind the dunes. And if anyone is swimming up in that north corner in a storm surge like the image posted then they may have to learn the hard way. Stop being greedy, selfish men. Start thinking about the world your kids and there kids will be living in. Heres some homework for all you mass planted beach vegetation lovers. There are a zillion examples in scientific studies of the vegetation species found on the seperate zones in dunal systems. There is no vegetation on the swash zone, no vegetation on the beach as this zone is affected by waves, grasses and ryzomes on the incipient zone and secondary vegetation such as acacia sophorae, on the foredune which is way behind the beach. The distance between all of these zones is quite wide in most cases. This is all we want because it works. You people for some reason believe the beach should be totally covered with mass planted secondary dune species all the way to the water. Studies have shown it will not protect against sea level rise as its only sand and plant mater. Your hearts are all in the right place but fiddlying around with the coastal system is wrong. We are not anti dune vegetation lobbyists, just anti dune vegetation in the wrong places. How about you show us proof that the vegetation should be totally covering beaches? The anti-dune vegetation lobbyists keep singing the same public safety song .. lines of sight .. people getting washed away etc. It pays to look at beaches on the entire eastern coastline before jumping to conclusions. I admit that in some situations and beaches the vegetation has grown beyond the original planting zone but at other locations the ocean continually erodes the dune system and coastline. I was recent at Kirra Beach in Queensland and there is only one small dune between Pizza Hut and the high tide line. Sand was blowing into the car park and restaurant and wave action was threatening the property. Manyana beach on the NSW south coast has been eroded by the same storm that left large sand cuts and scarps on many Wollongong beaches. Manyana beach is a natural system, no man made plantings yet the ocean did the same damage as on the planted beachfronts. The anti-vegetation lobbyists never mention the results of erosion on the beaches like Manyana or Kirra. They also do not mentions beaches like North Wollongong beach which has been accumulating sand. The erosion and sand deposition cycle is very complex and no manual can cover all situations. I understand why people want wide sandy beaches and great views but I also understand why councils want to protect infrastructure. Look at photos of the large 1974 storm event that nearly claimed Wollongong Surf Club, Byrpn Bay Surf Club and so many coastal properties and you will see why vegetation was planted. I am not against dune management but I do oppose wholesale removal of vegetation for weak reasons. If the life guards cannot see the ocean then build them better towers .. it is as easy as that. The vegetation zone is the last line of defence against erosion. Removing vegetation will not fix the problem. Nature will do what nature will do. If sand was not mined from our beaches we probably would not be having this debate. “The vegetation zone is the last line of defence against erosion. ” That may be true Mark, but it is also proven to be the first contributor to turning a beach “reflective”. Once a beach becomes reflective, it begins to erode faster. Planting to close to the water line in an attempt to save the beach actually contributes to killing it! See the pic of “lake Woonona” at the top of this article. It’s not the fact that there is vegetation on the dune at the back of the beach that is the issue, it’s the location of that vegetation and it’s proximity to the shoreline, (swash zone and berm) that is. Preventing a beach from becoming reflective is the best way to prevent erosion. A dissipative beach, with a wide Sandy berm will withstand the onslaught of a storm surge far better than one where storm waves slam into a root bound wall. Some people look at that pic above and say….” See, if that vegetation wasn’t there all that water would be up in the street.” This is a short sighted snap shot that fails to recognise the previous months of wave action that lead to the creation of this scenario. In the very first instance, many months prior, it was the interaction of sea water with vegetation that initially started the scarping cycle and the lowering of the beach profile. It started as only a 1 foot scarp which subsequently developed into a 4m wall. I watched it happen. If the vegetation had not crept so far seaward, that initial 1 foot scarp, a sand only non root bound scarp, would have easily collapsed and repaired. If you don’t visit the beach every single day and watch the process, I can understand how it is difficult for you to comprehend. Another obviously astroturfed campaign worsening the long term problems for residents and the regions biodiversity. So many lovely animals that residents really enjoy (like fairy wrens) need that vegetation. On the flip side this is great news if you have a stake in coastal property values. 1. No amount of vegetation will stop a storm surge Large enough to threaten property. A recent surge ate away 3m of vegetation from Woonona beach. The ocean will always reclaim any area of obstacles we plant in its path as it attempts to regain it’s natural level. 2. Vegetation has its place on the dunes but it has no place in the sensitive inter-tidal zone. By allowing obstacles to encroach into the swash zone, you are directly contributing to and amplifying the effects of erosion by creating conditions that generate Reflective wave conditions. If you are serious about reducing the effects of erosion, then you must educate yourself about what areas of a beach should be planted and what areas should be left free. 3. It is a well known fact that Sea Walls generate and amplify erosion at their base, often leading to the failure of that wall. A sea wall made from tree root systems is no different and contributes to erosion. The surf club at South Beach that fell into the water decades ago was a victim of the interaction of wave action with the sea wall that held it up. 4. Fact. A beach will regenerate quicker under dissipative wave conditions. In other words it will accrete or regenerate sand faster and build beach width quicker. A reflective beach generates turbidity, and causes erosive cycles to last longer. Setting conditions that allow for dissipative waves means less erosion during storm surges. If you are all for reducing erosion then you must be for stopping the erosion cycle developing in the first place. Which means keeping obstacles out of the inter-tidal zone. 5. The property value arguement is a lame excuse. For one, If a property owners view is planted out, then it follows that the same view for the rest of the public is also planted out. Water views are valued most highly by the majority of the community. This is a fact documented in Wollongong Councils Development Control Plans. Accordingly, it is highly appropriate that spectacular coastline vistas are maintained for all the public to enjoy. Those who seek to plant out those vistas should be held to account. Wollongong vistas are a major tourism draw card. 6. Finally, a 3mm sea level rise does not generate a 6meter high scarp. You have to ask yourself what else could possibly be contributing to the formation of such large scarping. Here’s the tip. It’s not global warming. If Simon could please provide reference material to validate his seemingly expert analysis of wave energy and erosional processes (please no more anecdotal examples)? Interesting to note he admits in to view-related property values (and tourism) being an agenda to removing vegetation. Thanks for clarifying Simon. Dear Caitlin, Reams of relevant referenced material has been collated and presented to Council on this matter. They have assessed that material and all contrary submissions and have come up with what I think is a balanced plan. But just for you I’ll provide some limited extracts below on a small part of the issue. What references do you have to show for your outrageous claims? You seem to forget that we are not about removing all vegetation from beaches. If you were truly concerned about the beach, your irresponsible attitude towards the sensitive intertidal zone should be different. Do you understand the various vegetation zones on a beach and what types of vegetation should inhabit those zones. If you do, why are you defending the over-run of the primary vegetation zone with aggressive all consuming secondary vegetation species? We don’t mind a bit of vegetation at the back of the beach, the hind dune and the landward side of the foredune. But, do you realise that the Hind Dune, and the Fore-dune to a lessor extent has already been built on (roads houses footpaths etc)???. These are the locations where the secondary and tertiary vegetation should be located, but it’s not. The beach as you see it today is what is left of the Incipient Fore-dune. Only primary vegetation should be located on this zone and then only toward the back of the beach. Yet, some people who are not aware of these vegetation zones and the important role they have on our beach, seem to want to squeeze an entire dunal vegetation system into the space that is only meant to contain primary species. Why? Consequently, the beach berm and the swash zone are now interacting with vegetation that has encroached too far seaward. I find in incredible that people like you seem to think that you have a monopoly on the issue. When confronted about your mindless need to want to plant every square inch of this country, you default to your own anecdotal, unsubstantiated claims in an attempt to support your own agenda. A lesser known fact of roots in dunes is that they form steep scarps after large storms have eroded away the base of the scarp. By preventing the dune from collapsing, these roots hinder the formation of a gradual wind profile, necessary for the beach to repair its damage. As a result, the eroded sand remains in the sea, laying the beach flat. Successive storms keep eroding the steep bank further. Once dunes have been planted for stabilisation, the dense vegetation starts to trap the sand. Once trapped, the sand can no longer move. The dunes grow and become a single large dune. The plan appears to work. But once the dune has grown sufficiently tall, it lifts the sea wind from the beach, impairing its self-repair mechanism. The sea starts to eat into the tall dune, carving a steep bank (scarp). Sand can no longer saltate up this bank and the dune stops growing. With every storm the dune erodes further The massive amounts of sand from this process cause sand banks further in sea and the beach to lay flatter. There’s no more dry beach and the wet beach won’t dry anymore. The system’s self-repair mechanism is now permanently damaged: the beach won’t dry, the sand won’t blow, the dunes won’t roll and erosion becomes permanent. The dynamic dune/beach system has died. (This is what happened last year when Woonona beach was turned into a Lake with deep water lapping at the vegetation front. Luckily, the beach recovered many, many months later after an unusual bought of calm swells. Had the vegetation front been back further up the beach, those storm waves would have dissipated their energy up a long run-up zone with significantly less scarping. However, vegetation caused reflective wave patterns to develop and caused deep scarping to occur with the subsequent lowering of the beach profile which then flooded! Finally, Professor Simon Haslett is one of the Professors who has followed the planting of Wollongong beaches since way back. When recently asked about what was causing such massive scarping on our beaches he quite openly was astounded at how far into the inter-tidal zone the vegetation has spread. He made this comment, “having viewed the historical photographs, it makes it clear that the coastal wattle now occurs on beach surfaces of the original intertidal zone. The resulting sediment sink builds up the back-shore, depriving the foreshore/inshore, and becomes scarped. Viewers of this are strongly recommended to visit the ‘Sand On Beaches’ (BCI) Facebook page”. If a Professor and commentator of Beach Morphology can come out and state the bleeding obvious, why can’t you see it. Even the Council appointed Consultants, one of which is a personal acquaintance of Prof Haslett, indicated that we were arguing in the right direction on this matter. What academics do you have to support your claims Caitlin? The NSW government will order councils to study the scientific evidence for sea-level rise on a beach-by-beach basis, amid fears that many local authorities may be undermining property values by imposing punitive planning conditions based on predictions contained in reports of the UN Intergovernmental Panel on Climate Change. The Great Lakes Council on the mid-north coast has told one home owner who wants to extend his house that, while it may be approved, he may have to demolish it in coming decades and restore the whole site to its natural state pre-settlement.The council is relying on the IPCC model that predicts sea-level rise at nearly 10 times the actual rate recorded in recent decades – 40cm by 2050 – compared with just more than 4cm, based on a projection of the recent historical record. We’ll done NSW Government, for seeing through the hysteria and relying upon actual real world observations, rather than fanciful manipulated predictions.